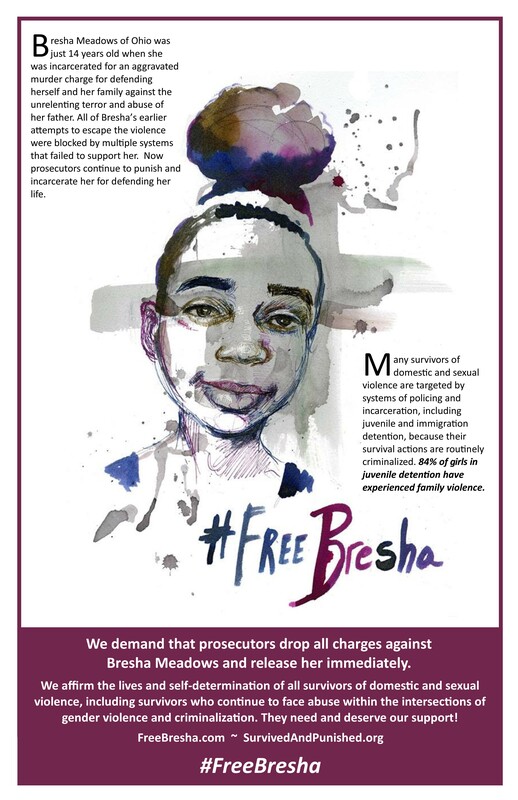 Join the campaign to poster the planet with #FreeBresha posters during the Apr 10-17 week of action! Hang the posters in public spaces to create high-level visibility about Bresha Meadows’ case in our communities. Posters in public spaces is also an organizing strategy to raise awareness about the connections between surviving domestic/sexual violence and being criminalized. Or contact us to pick up some beautiful hard copies distributed by our partners in cities across the U.S..
Or order low cost printing of the poster from this website. Circulate posters in your networks far and wide, including posting in your community, campus, organization, local storefronts, place of worship, etc.